↑ "Prunus persica". The Plant List. Version 1. 2010. Retrieved 29 November 2012. 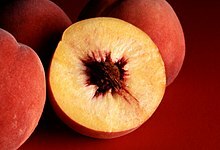 ↑ "Top 10 Largest Producers of Peach in the World | Which Country produces Most Peach in the World". WhichCountry.co. Retrieved 2014-08-25.